The National Society of Black Engineers Junior program, also known as the Pre-College Initiative program (NSBE PCI) will lead the world in enhancing the pre-college students’ Academic, Technical, and Leadership skills in order to maximize their success in life. 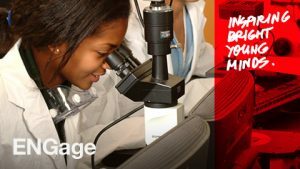 The Pre-College Initiative (PCI) Program is designed to stimulate the interest in science, technology, engineering, and mathematics fields, or STEM. Our PCI program provides activities to help students discover firsthand how engineering and technology relate to the world around them and discover the excitement of academic excellence, leadership, technical development and teamwork. A collaboration between the University of Toronto Chapter of the National Society of Black Engineers (NSBE U of T) and the Engineering Student Outreach Ofﬁce at the Faculty of Applied Science and Engineering, ENGage is a unique program for motivated students in grades 5 to 8 who have an interest in science and engineering. This unique program provides students with the opportunity to learn about science, technology, engineering and mathematics (STEM) in innovative ways. It aims to highlight black role models, develop STEM literacy and promote academic and social growth and development for black youth. Click here to see the ENGage website.